Fresh off their thrilling and historic 5-2 win over the Pittsburgh Penguins on Wednesday night, the Washington Capitals get right back to work on Friday night as they host the Chicago Blackhawks at Verizon Center. 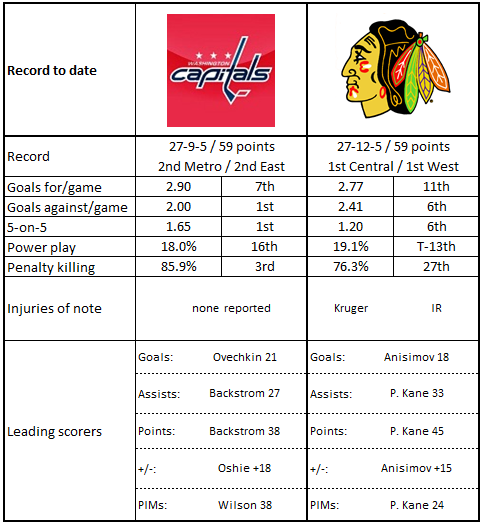 The Capitals, already carrying a season-long seven-game winning streak, look to make it eight at the expense of the Blackhawks. For their part, Chicago is bringing a four-game winning streak to Washington, all four of the wins earned in the friendly confines of United Center. That four-game Blackhawk winning streak is one of those things in which where you stand depends on where you sit. The four-game streak is the third this season for the Blackhawks of four or more games. On the other hand, of the four wins, three of them were of the one-goal variety, two of them won in overtime. None of them were earned against a team currently eligible for the postseason (Buffalo, Carolina, Nashville, and Detroit). Perhaps predictably, Patrick Kane is the top point-getter in the Blackhawks’ four game winning streak (1-7-8, plus-3). It is hardly a new role for the ten-year veteran. Since he came into the league in 2007-2008, only three players have more points – Alex Ovechkin (803), Sidney Crosby (761), and Evgeni Malkin (719) – than Kane (708). Over the last five years, including this one to date, only Crosby (374) has more points than Kane (339). He has made those points count, especially when he records multi-point games. Chicago is 24-4-2 when Kane records at least one point, 9-1-0 when he records at least two. His performance on the road is a bit more mixed this season, though. In 19 road games, Kane is 5-10-15, minus-7, and he is a plus player in only two of those 19 games. He is 3-4-7, minus-8, in 11 career games against Washington. Chicago has two of the five oldest defensemen in the NHL to have dressed this season in Michal Rozsival (38 years old/3rd oldest) and Brian Campbell (37 years old/5th oldest). Rozsival has been a healthy scratch much of the season, appearing in only 12 of Chicago’s 44 games so far. On the other hand, Campbell has been in the lineup night in and night out (42 of 44 games). Now in his 17th NHL season, Campbell ranks third among active defensemen in career games played (1,044), trailing only Zdeno Chara (1,313) and Nick Schultz (1,053). The odd part about his longevity is that his durability improved with age. Campbell completed five consecutive seasons appearing in every regular season game through last season. Oddly enough, the streak (which reached 423 consecutive games played) ended with a healthy scratch against the Nashville Predators on December 29th, one of two games he missed this season. His numbers and ice time have dropped over the last several years, from 52 points and almost 27 minutes per game with Florida in 2011-2012 to 12 points so far in 42 games and an average of 18:45 in ice time per game this season with Chicago. In 44 career games against Washington, Campbell is 5-18-23, minus-16. Corey Crawford probably does not get enough credit for the job he does as the number one goaltender for the Blackhawks. He is rarely included in the discussion of the league’s elite goalies, but there he is, just about where he always is – tied for 12th in wins (16), 14th in goals against average (2.35), 8th in save percentage (.925), and tied for 11th in shutouts with two (minimum: 1,000 total minutes played). Not “elite,” perhaps, but certainly a solid and consistent performer. And, there are those two Stanley Cups over a four-year period on his resume. Only five goalies over the last four seasons, including this one, have more wins than Crawford (198), and all of them have appeared in more games. He has been amazingly consistent over his last eight games, allowing no fewer than two and no more than three goals in any of them, posting a record of 5-2-1, 2.64, .918. In eight career appearances against the Caps, Crawford is 3-3-2, 3.26, .890. 1. Chicago is the only team in the Western Conference having two players with more than 40 points. Patrick Kane and Artemi Panarin each have 44. 2. Only the Los Angeles Kings have scored more goals in overtime (eight) than the Blackhawks (seven). 3. Chicago leads the league in one-goal victories (17). Including extra time games, they have also lost 11 one-goal games. 4. Only two teams in the league have a larger positive special teams time differential (power play time minus penalty killing time) than Chicago (+34:58) – San Jose (+45:29) and Philadelphia (+38:54). 5. Some folks might be surprised that the Blackhawks rank as low as they do in shot attempt shares at 5-on-5, but they rank 14th overall in Corsi-for at fives (50.33 percent). 13th in road games (50.57 percent), and 20th adjusted for score, zone, and venue (49.31 percent; numbers from Corsica.hockey). 1. The Caps have allowed just one shorthanded goal this season. Only Columbus and Buffalo have allowed none. 2. Only two teams – St. Louis (92) and Calgary (77) have been shorthanded more often on home ice than the Capitals (76). 3. You can probably bet there won’t be a fight in this game. Only three teams have fewer fighting majors than the Caps (five). Chicago is one of three teams tied for fewest with four. 4. If Nate Schmidt and Brooks Orpik were to record a point, it would give the Caps 14 players in double digits in points. Last season the club had a total of 16 players with at least ten points. 5. Nicklas Backstrom and Alex Ovechkin have spent a lot of their respective careers together on the ice, but here is an odd illustration of it. Both are averaging 18:21 in total ice time per game. And, they are separated by just one second per game in ice time, Ovechkin with 14:26, Backstrom with 14:25. If Caps fans were to name a Chicago Blackhawk, they might immediately respond with a Patrick Kane or a Jonathan Toews. Maybe even a Duncan Keith. Prompt them with “Ryan Hartman,” and they might respond, “who?” Well, listen up. In the Blackhawks' four-game winning streak, Hartman leads the team in goals (four), and he is tied for fifth on the club in goal scoring this season (10). Taken with the last pick of the first round in the 2013 entry draft by the Blackhawks, Hartman did show some goal scoring potential in juniors (48 goals in 108 games over two seasons with the Plymouth Whalers) and in the AHL (28 goals in 130 games over two seasons with the Rockford iceHogs). The ten goals in 39 games this season from the only native of South Carolina to reach the NHL might be a bit of a surprise, though. He had his first NHL hat trick in a 5-2 win over the Nashville Predators last Sunday, and he has five points in his last two games. He has no points in one career game against the Capitals. When Steve Oleksy nearly took out not one, but two Capitals (Dmitry Orlov and Marcus Johansson) with knee-to-knee hits in Wednesday night’s 5-2 win over the Pittsburgh Penguins, one might have expected to see Tom Wilson on the ice to take a pound of flesh for those potentially dangerous plays. In previous years, one might have counted on it. This year, Wilson is not the marauder across the landscape of previous years. He still leads the Caps in penalty minutes with 38, but he is on a pace to finish the season with a total (76) that is less than half what he posted last season (163). And, he has just four fighting majors this season, continuing a downward trend from his rookie season in 2013-2014, when he had 14 fighting majors, through last season, when he had just seven. It speaks to a growing maturity in Wilson, who appears more inclined to pick his spots to be ornery, and who (perhaps with more than gentle prodding from the coaching staff) is learning that time spent in the penalty box is not productive, especially when you’re the only one heading off. Wilson seems to have taken this rambunctious energy and used it to become an effective part of the regular rotation of penalty killers – he ranks third among forwards in shorthanded ice time per game (2:22). What he is still searching for is some consistency in his offensive game. With two goals and two assists at the half-way mark of the season, he is on a scoring pace (4-4-8) that lags well behind his scoring last season (7-16-23 in 82 games). He does not have a point in his last five games, and he does not have a goal in his last 14 contests. Wilson does not have a point in seven career games against Chicago. The Caps are in a particularly rough portion of their schedule. Over their last six games they played Ottawa twice, Toronto, Columbus, Montreal, and Pittsburgh. That is a group that has a combined record at the moment of 119-54-27, and only Toronto is not a playoff-eligible among them. It is no small thing that the Caps won all six games against those teams as part of a seven-game winning streak. And now, they get the Western Conference leading Blackhawks on a bit of a roll, a team with a very respectable road record (10-8-1), but one that has not been on the road for a bit (the lost to the Blues in St. Louis, 4-1, on January 2nd). It is a lot to expect the Caps to keep dialing up superior performances against this level of competition over a long stretch, but that is just what the club has done. Chicago poses something of a unique challenge. Washington will come into this game having won four straight meetings against the Blackhawks and seven of the last nine contests. Few teams can say that over the past few years. Such things do not seem to faze the club these days, though, so why not bet the streak?